Thyme for horsing around in Maryland? In a recent post, I mentioned that, one month out from the start of Summer, we had experienced the coldest early-November conditions in decades. So, we cooked indoors, day after miserable day. But there was a silver lining to the heavy clouds! We took the opportunity to fine-tune our take on a recipe I had found while searching for an addition to our chicken maryland repertoire. As a two-person household, we often use these pieces for a quick roast dinner, as the meat retains its moisture better than do chicken breasts. Part of the appeal of the recipe I put on our kitchen bench was that it featured two ingredients which grow profusely in our kitchen garden: thyme and horseradish. We have prepared this dish three times in the last couple of months. Along the way, we have made numerous changes to both the method and the proportions of the ingredients. Here is our version of the recipe. Place the stock, wine and thyme in a small saucepan, bring to the boil and simmer for 5 minutes. Remove pan from heat. Remove the thyme from the pan and reserve. Once the liquid has cooled a little, combine it with the horseradish and mustard. (Use the pan if it is has a pouring lip; otherwise, use a pouring jug). Heat about 30ml of olive oil in a flameproof roasting pan over medium heat. Add the pieces of potato and cook them for 3-4 minutes. Transfer potato to a warm dish. 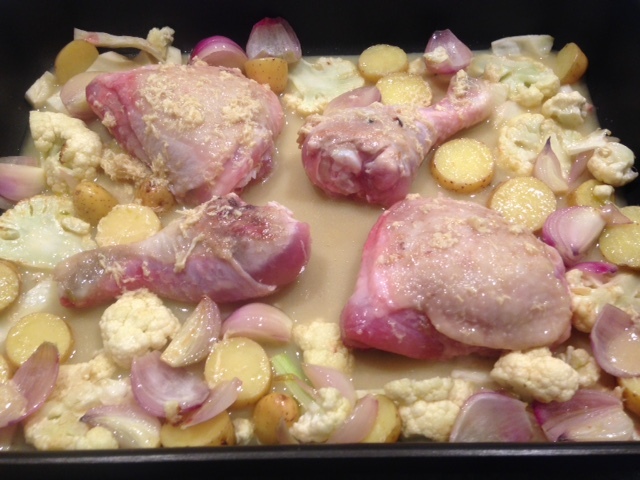 Add the cauliflower and onion to the roasting pan and cook for 3-4 minutes. Transfer them to the dish with the potato. 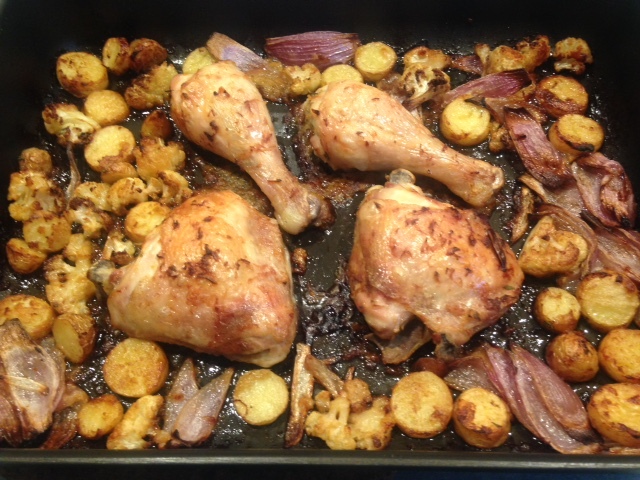 Cook the pieces of chicken in the roasting pan, turning once, until they begin to go a pale, golden brown; say, 5-6 minutes. Turn the heat off. 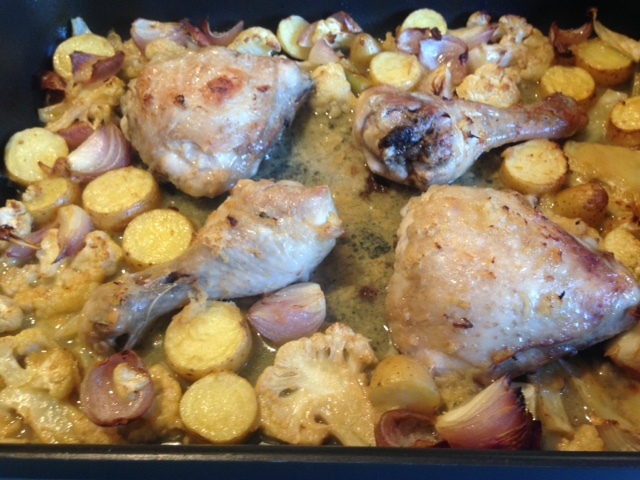 Place the roasting pan in the oven and cook for 45-50 minutes, casually turning the vegetables once or twice, until the liquid has evaporated and the chicken and vegetables are cooked, including some tasty caramelisation of some of the onion. Serve with a green side-dish, depending on what is in season, eg asparagus, beans, broccoli, salad leaves. 1. If your marylands are small, use more and leave them in one piece each. 2. We heat the stock, wine and thyme both to extract flavour from the herb and to speed up the roasting process by having the liquids already warmed. 3. 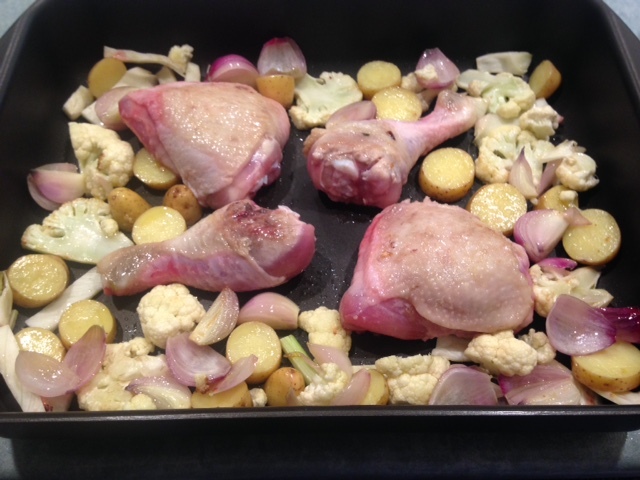 We leave a space in the centre of the roasting pan because it is the last spot to dry out during the roasting process – not suitable for roasting those vegetables! 4. To achieve a crispy skin, we cook the chicken for longer than we might normally do. This is because the evaporating liquid creates a ‘steamer’ effect for the first 20-25 minutes, ensuring the meat remains moist despite the longer cooking time. About the weather: Yes, I do mention the weather quite regularly. Truth is, it’s a bit of an obsession here in Melbourne; other Australians say that we live in the city where you can have “four seasons in one day”! 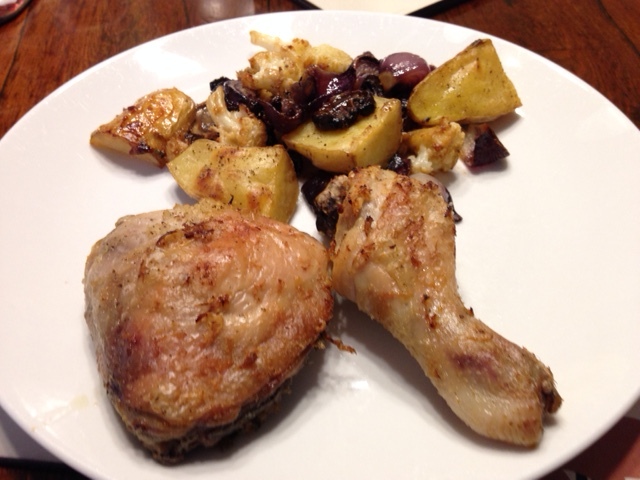 This entry was posted in Cooking and tagged Chicken marylands, Horseradish, roast chicken, thyme. Bookmark the permalink.